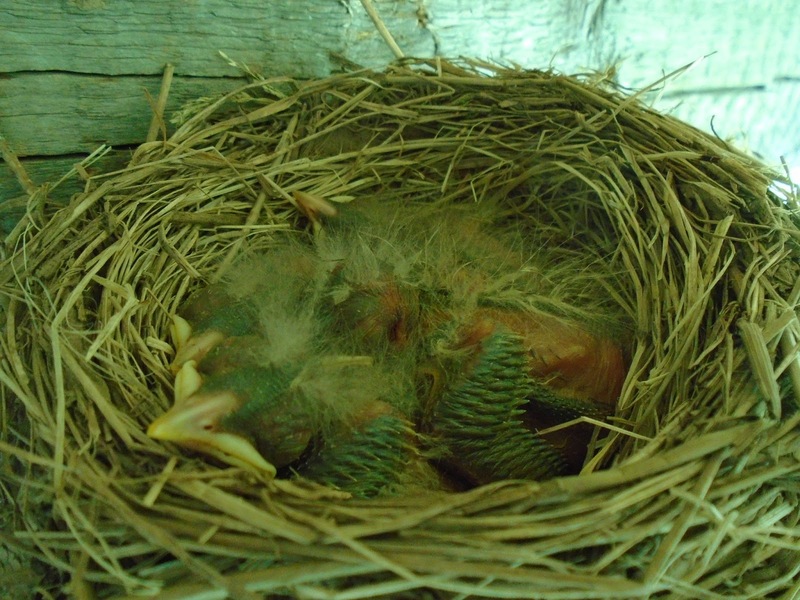 Pea Pickle Farm: why did the robin build her nest right where she did? why did the robin build her nest right where she did? A few weeks ago, Josie, Elliott and I were surprised and a bit excited to see a robin building her nest on the east end of the crossbeam just below the outer edge of the roof that covers the upper deck. We surprised her, she flew off in a flash, leaving behind a few scraps of straw that in a day or two blew away. 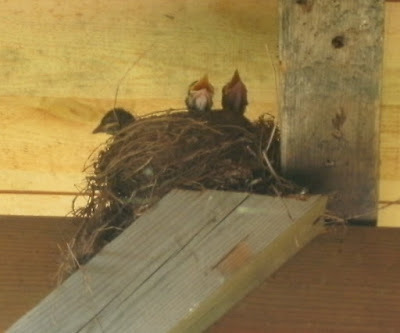 I thought that was the end of it, and I was somewhat sad, because my first summer here there was a robin’s nest on the other end of that crossbeam, and it was filled with a trio of baby birds. Winkin, Blinkin and Nod, in concert, 2011, West End Crossbeam. Back then I was rarely in the loft, it being unfinished and all, or was I up there finishing it? Anyway, it was just me and old Buster then, and old Buster was no threat to anyone, so the robin settled in and laid her eggs and raised her young, twice. And I remember the following spring a robin checked out that old nest, but maybe that was when I was putting up the deck railing or something. That robin didn’t stick around. Now, for the past three years, the West End Nest has been in decay. It looks like a clump of mud. But then, one morning a week or so after startling that robin building on the east end, there she was (or maybe someone who looks just like her? ), sitting on a brand new nest. And this nest is a beaut. But why on earth did she build it right there? There’s a person, a dog, and a cat gawking at you here, Missie! 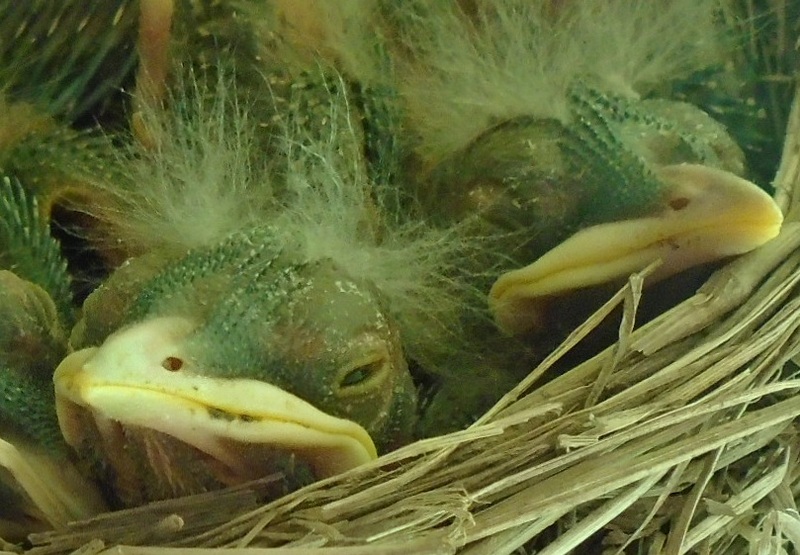 And how did we miss the whole nest-building act? From that morning on, every morning, every afternoon, every evening, every night, on that nest she sat, and it got so every time I went upstairs I was afraid I’d catch her right in the middle of laying an egg or something. There she sits, the East End Nest. 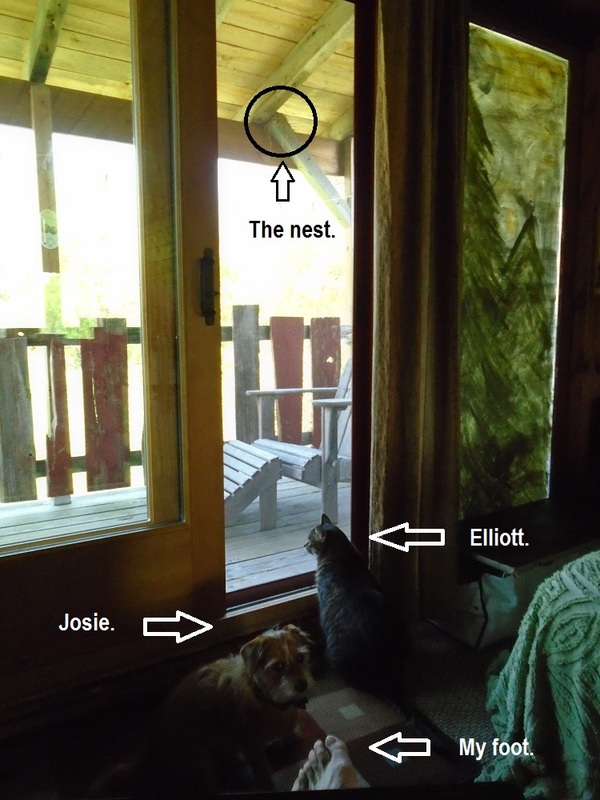 We watched through the screen door, Josie, Elliott and I, and I, at least, tried to be quiet, tried to move slowly, tried to show a little respect. Then I got started on the loft window trim project. I had put off this project long enough, first waiting for the carpenter who said he would do the work to show up and do the work, and then consternating over how to do the work myself. The carpenter had said it was a tricky job, this wall of mostly windows, looking out over the upper deck, uneven and not exactly professionally put together, at least not put together in a standard way, with standard materials, so I believed what he said, that it was tricky, and how could I complete a tricky carpentry job? This project had become just another “thing,” a thing I could not move on. The bare two-by-fours and tufts of pink and yellow insulation and scraps of plastic and the ripped edges of the finished wall mocked me, every day, for years. Now it was time, robin’s nest or no, to fight back, to get this thing done, to trim those windows. The loft and upper deck, once upon a time. One day I stared at the windows. The next day I took some measurements. A few days after that I bought two one-by-four-by-eight and two one-by-six-by-eight pine boards. 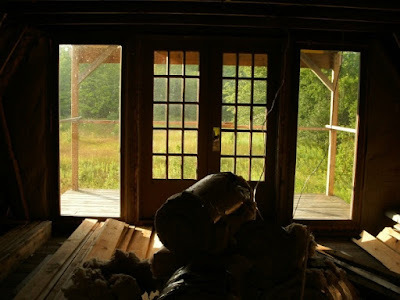 I remeasured, sawed the one-by-fours, put them up across the top, measured again, sawed the one-by-sixes to fit nicely down either side of the door, realized I’d made a false start with the top boards, redid that, stained the boards black. The project was now half done. Throughout it all Missie Robin remained steadfast on her nest. I worked as quietly as possible, but the fact is when you’re pounding a nail into the wall, you’re pounding a nail into the wall. Every once in a while Missie did fly off, but soon she returned. I had a vision on how to finish the project, so I went back to the lumber yard for two more one-by-fours and one more one-by-six, asking mistakenly for two four-by-ones and one six-by-one, which really confused the cashier. We don’t carry that, she said. Oh, but you do, I said, I bought these same boards last week. She stared at me. I stared at her. Somehow we figured it out. Perhaps needless to say, I find carpenter lingo very confusing. 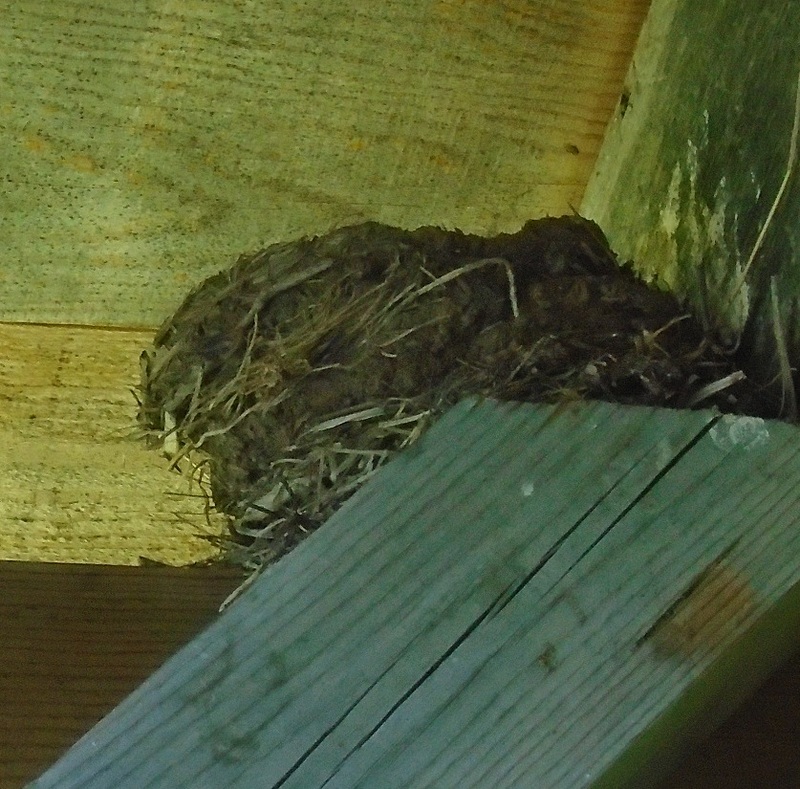 So I must confess: I don’t know if that’s a crossbeam that the nests are on. Could be something else, perhaps a header, but I toss around that term also in complete ignorance. On Tuesday I was able to put up a curtain rod and curtains. Missie Robin was not around. Oh! Wait a minute! There she is! Looks like she has something in her mouth and she’s poking around her nest. Now there she goes flying off again. I begin to wonder if the eggs have hatched. But I hear no peeping baby birds, see no little beaks gawking skyward. On Wednesday I’m hanging up laundry and measuring and sawing one-by-fours and wondering … where is Missie Robin? She comes and goes but mostly, it seems, she’s gone. When I awaken Thursday with the dawning light, I hear the shoosh of a light rain on leaves. Otherwise, quiet. The door to the deck is open, the air is cool. I begin to worry about Missie Robin. If the eggs have hatched, where’s the peeping? 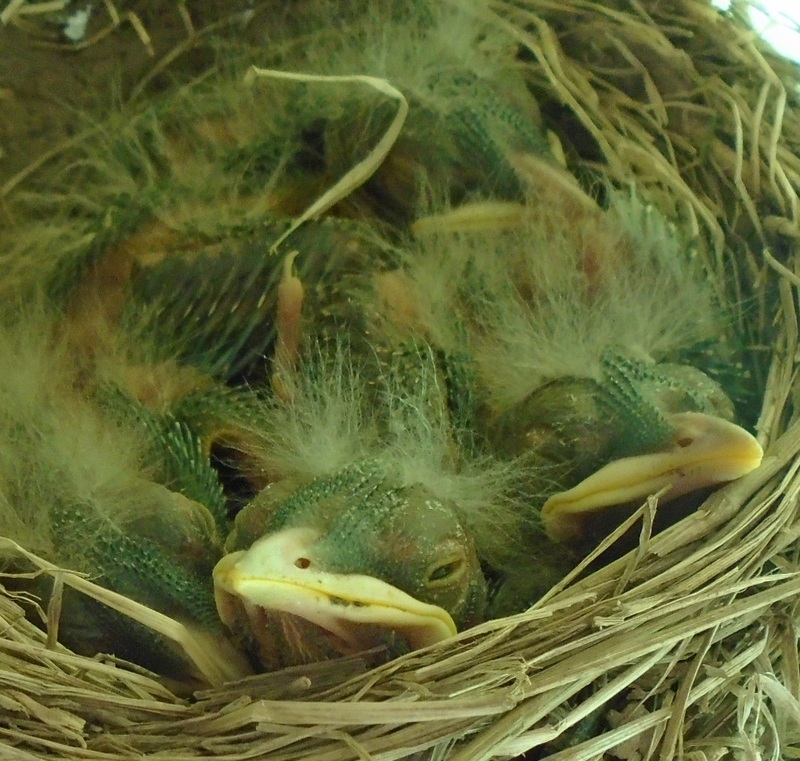 Aren’t baby birds supposed to peep? Or is that just chicks? But aren’t these chicks? Or do only chickens have chicks? Later, from where I stand looking out through the screen, the nest looks empty. 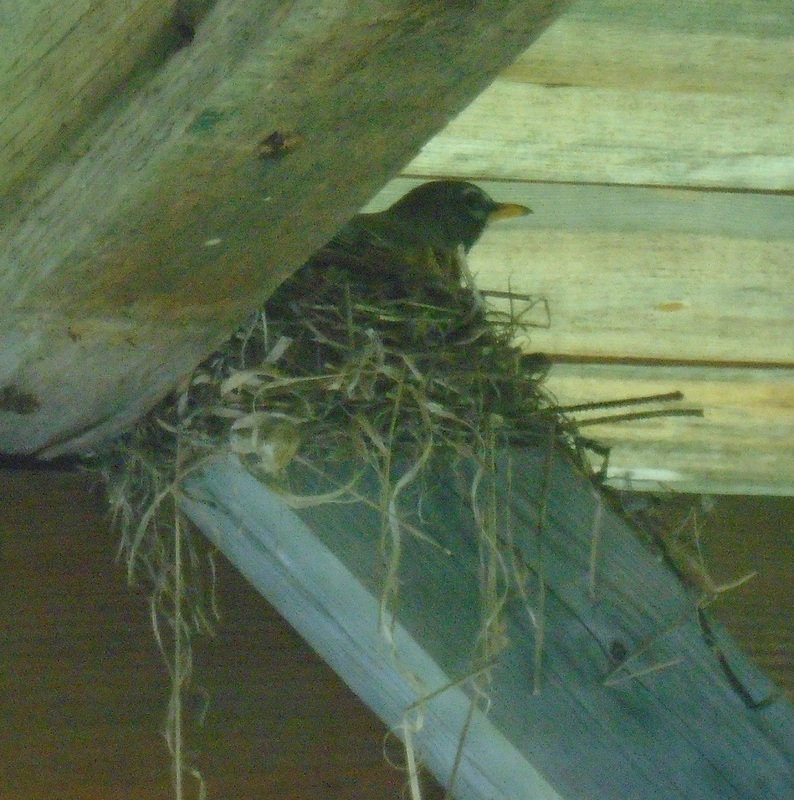 That afternoon I decide this worrying is ridiculous, so I take a half hour to sit in the loft, watch the nest. I notice a deer in the north field and a hummingbird sitting atop the spruce just east of the deck, and there is a robin in the spruce. Josie becomes aware of the deer so we must go downstairs, I must let him out. He chases a different deer, one grazing in the west field, and he is satisfied. Back upstairs, we jostle for position. Avian Paparazzi convening on a Thursday afternoon. Missie Robin shows up with what looks like tufts of grass in her mouth. She does something with this grass in her nest, then is off. Can she hear us? (We are quiet.) Can she sense us? Am I disturbing her? What is going on? While waiting, I poke around on the Internet and find that robins often nest close to humans, that their eggs hatch in about two weeks, that three weeks after that the birdlings begin to fly, go their own way, maybe hang around for a bit, badgering Ma and Pa for food, but then off they go. I play some of the robin calls, including the yeep alarm and cuck call, and get some answering yeeps and cucks from over spruce way. Missie Robin comes and goes, always with some morsel in her mouth, and suddenly we see the tip of a trembling beak reaching just over the top of the nest. Aha! At last! 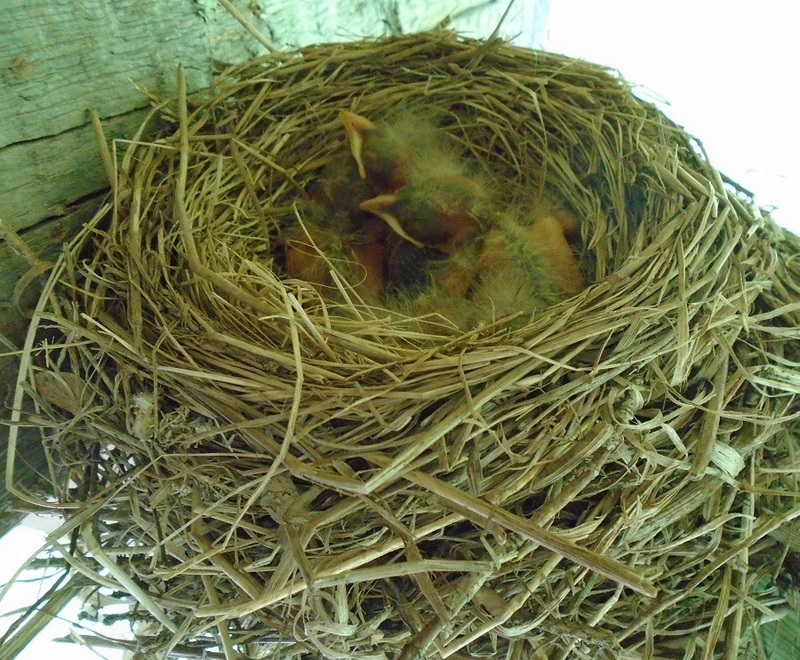 Baby robins! Later I snap a picture. Aren’t they cute? The next morning I slowly pull back the curtain, see Missie Robin on the nest, keeping the hatchlings warm. Throughout the day I catch a glimpse of her now and again as she brings a beakful of something or other back to the nest. Friday I snap another picture. Saturday. Hey! I think they like me! And I know now that before I know it, these kids will be off, flying away, on their own. I still don’t know why Missie Robin built her nest right where she did, but I’m glad she did. One morning I hope to wake up and hear these beaklings clamoring for worms and stuff. Maybe I’ll name them Grubbs and Stubbs and William. I do think there are three, though only two are readily apparent. I have not looked directly into the nest—wouldn’t that be rude?—but rather I have held the camera slightly above and clicked. Of course, that’s not rude. I am beginning to think these fellers are pretty cute. And, by the way, one year ago today, I brought Josie home. So much to celebrate. Grubbs and Stubbs, ready for their close-up. I definitely see three little beaks in the photo. I was hoping today's picture would provide conclusive evidence on the existence of William, but all it showed was that baby birds are really peculiar looking. It is a marvelous nest. I can't believe I missed the building of it. William must be the runt of the litter, he seems to be there but in every photo is so hard to see. Josie and I celebrated by going for a walk, then picking ticks off each other. Har har. Perfect anniversary!